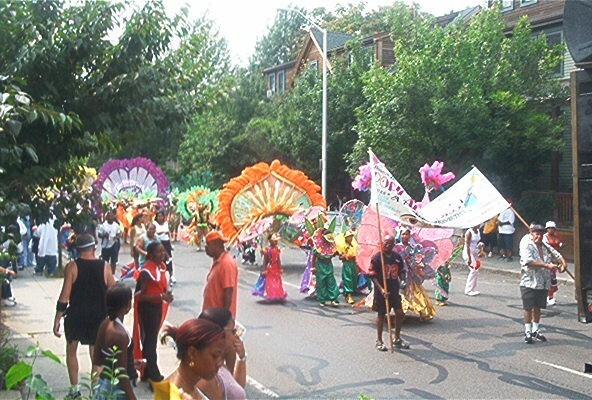 last weekend was boston's annual caribbean carnival. 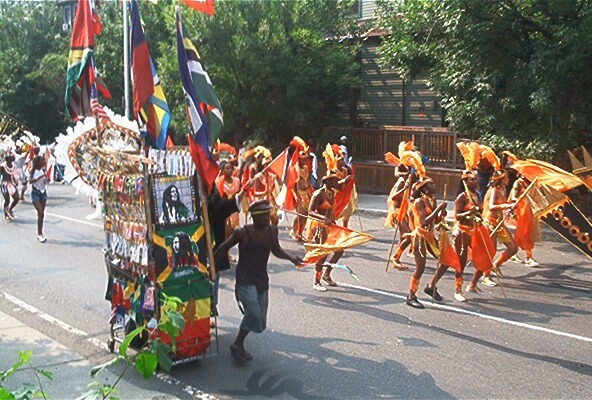 most of the festivities took place in dorchester, which boasts a large, vibrant caribbean population, with jamaicans, trinidadians, and hatians comprising the largest national groups. leading up to the weekend, down around blue hill ave, there were dances and concerts and costume-contests. saturday was the big day, starting in the morning with a j'ouvert and continuing through the day with a parade and plenty of dancing, eating, and drinking up and down MLK blvd. i spent sunday afternoon hanging out on river street in cambridge, watching the same floats and costumed-troupes make their way from the charles river up to central square. a few bands, including a spirited, acoustic delegation representing panama (who may have had the best music of the day: a straight-up caribbean percussion jam), marched up the road as a group, unaccompanied by any large vehicles. 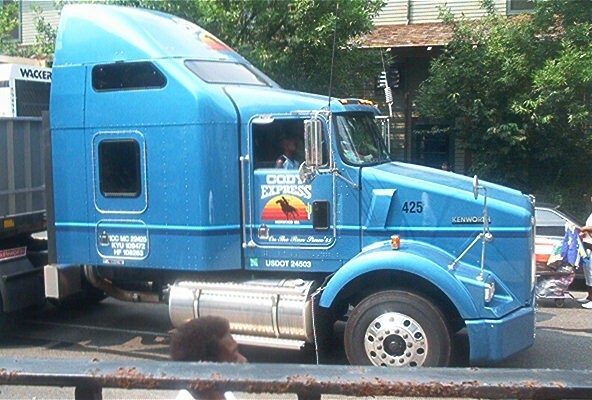 most troupes, however, were sandwiched between two large trucks: a flat-bed truck in front to carry the sound-system and the selector(s) and to motivate the marching dancers with the biggest "road tunes"; and a moving-truck to bring up the rear and carry extra costumes and other props. 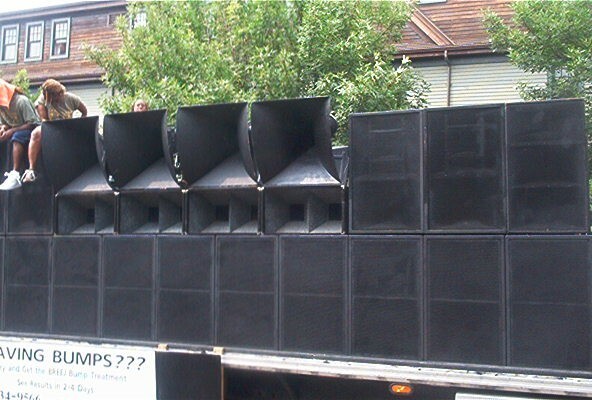 as the trucks slowly rumbled down the street, one could gradually feel the bass increase, big and round and warm. 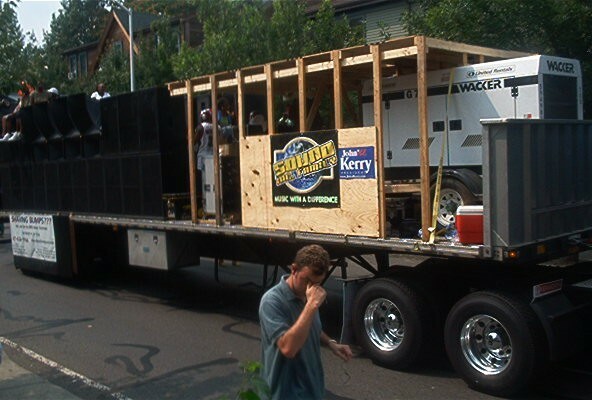 the soundsystems literally shook the houses on river street as they passed. they took their time, too, stopping regularly to let the dancers do their thing in one-spot, letting the more elaborately costumed folks spin around in full display, and generally rolling along at a cool 2 miles an hour, if that. i was struck by the strength of the caribbean presence in my backyard once again, though at this point i shouldn't be. incidentally, a new york times article published on the same day (last sunday) noted some remarkable, and rather relevant, statistics about caribbean migration (as a subset of "foreign-born black" migration) and, in particular, about the growing caribbean presence in the US, including boston: "In the 1990's, the number of blacks with recent roots in sub-Saharan Africa nearly tripled while the number of blacks with origins in the Caribbean grew by more than 60 percent, according to demographers at the State University of New York at Albany. By 2000, foreign-born blacks constituted 30 percent of the blacks in New York City, 28 percent of the blacks in Boston and about a quarter...in Montgomery County, Md., an analysis of census data conducted at Queens College shows." people were out representing fi true, waving their flags and shaking their things. 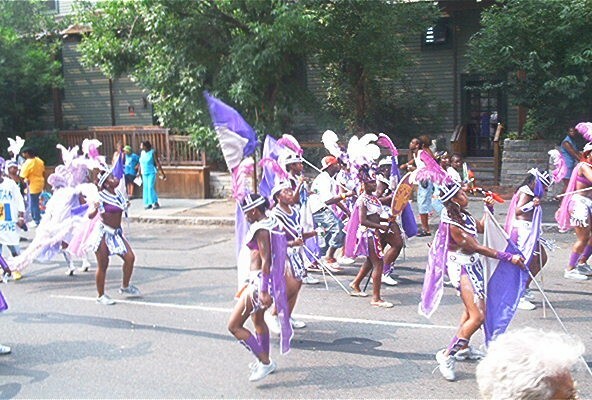 caribbean youths who blend into the african-american community during the rest of the year displayed their colors with pride. i saw flags representing small and big islands alike, and vendors were ready to sell badges of all nationalities to anyone interested in joining the party. it was a pan-caribbean event, to be sure. plenty of jamaican flags, plenty of spanish spoken too. 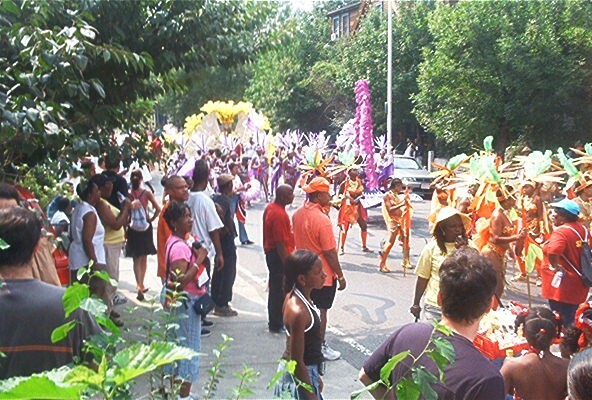 but the prevailing presence was without a doubt trinidadian, which is not surprising considering that t&t is really the home of caribbean carnival. 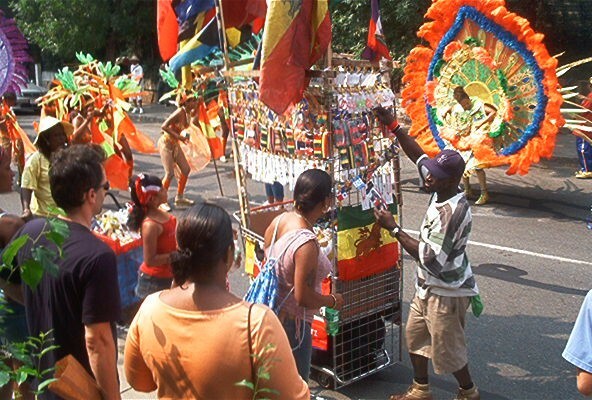 the other islands look to trini as a model for their own burgeoning carnivals. on this day, the trinidadians clearly had the most flags, the largest marching troupes, the most elaborate costume designs, and the biggest truck-borne soundsystems. soca was the music of the day, further confirming t&t's lock on the festivities. as you can hear on this recording i made, however, soca selecta style is rather indebted to reggae selecta style. note the way the selecta here talks over the music, greeting the cambridge massive, bigging-up his organization (the t&t social club, who clearly represented this year), exhorting the dancers following in the street. (you can also hear the music become less muffled as the truck approaches our spot on the street. the whistle in the background--a staple at carnival celebrations--adds a nice touch of ambience, too.) i heard a bunch of big tunes from last year, as well as a good number of new ones. generally, the same "big chunes" are played again and again, so i heard a number of songs a number of times, among them: plenty of repetitions of rupee's tempted to touch, which, like kevin lyttle's turn me on, is finally taking over urban US radio after being a hit in the caribbean for years. of course, the anti-gay lyrics, put in patois and over a thundering soca-beat, were lost on most of the cantabridgian bystanders, including my mother, who was fairly shocked to find out that such a nice sounding song could have such a vicious message. the irony reminded me of living in kingston during carnival 2003 and seeing signs advertising a party (misguidedly) called "soggae"--a hybrid of soca (which is itself a hybrid of soul and calypso) and reggae. apparently, and not surprisingly, the dance was a flop. who would expect jamaicans to come out to a so-gay party? i was inspired by the ironic, mal-informed coinage to write a song about jamaican (or, i suppose, caribbean) homophobia. over a soca-inspired beat (composed by none other than my gyal), i do my best to take on a heavy subject with some light humor. you can read the lyrics here, and hear soggae here. 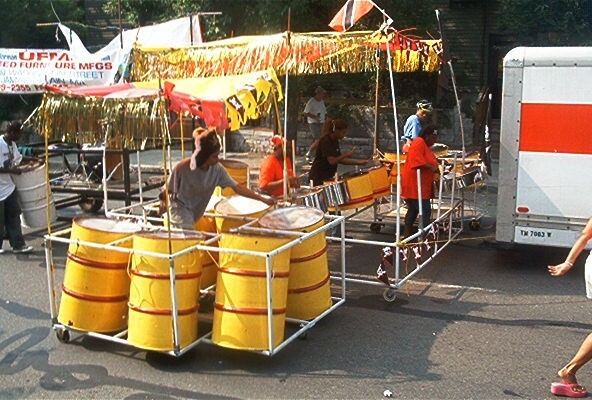 appropriately, the parade ended with a steel-band on wheels, representing the more traditional side of trinidad's carnival music. despite the stark difference in sound from the booming soca sound-systems, the distinctly caribbean rhythms of calypso--that ol' 3+3+2--were still to be heard from this ensemble. (again, you can hear the band get louder as they approach. note also the motorist that beeps along, also on a 3+3+2, as he drives by.) if you don't know what i mean by 3+3+2, listen for the syncopated bass drum--boom! boom!--that grows in prominence after about 30 seconds. 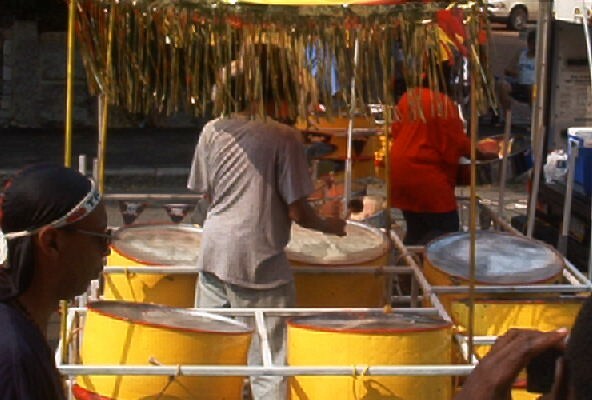 this same rhythmic structure--a way of breaking a duple-meter bar into polyrhythmic parts--is found across the caribbean, from soca to reggae to son to merengue, and gives the region's music much of its rhythmic dynamism. 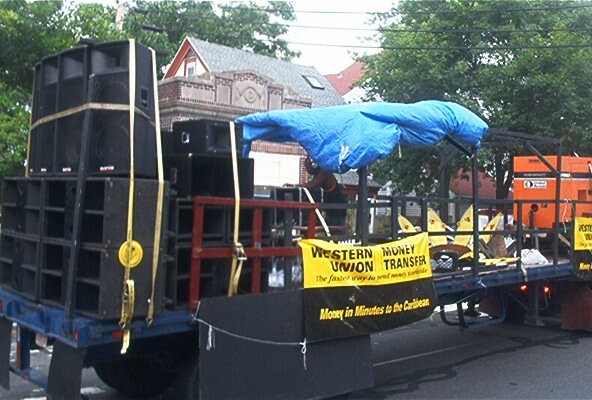 we followed the end of the parade up to central square, where the biggest sound-system continued to provide tunes and exhortations as the crowd danced on. elephant man's big summer hit, too bad mind, got a requisite pull-up. in a recording i made, you can hear a young, eager selecta talk over the tune after the first pull-up. he lauches a bit too quickly into a call for the "scooby-doo"--a recent popular jamaican dance--in my opinion, but you gotta give him points for enthusiasm. one interesting thing about the performance of too bad mind here is that the track is sped-up significantly: from an original bpm of 124, which is already pretty fast (although similar to a number of other recent uptempo dancehall riddims), up to 132. of course, 132 bpm is not fast for soca at all, which can sometimes exceed 160 bpm on faster cuts. with this modification--easily accomplished on a CDJ machine--the song evokes soca more readily than dancehall reggae. of course, the song already resembled soca with its four-to-the-floor bass (a rhythmic structure not found in much reggae since the early 90s), upbeat tempo, major key, and 3+3+2 accents. but actually, elephant man's track is based on a jamaican gospel tune, hear my cry, by marvia providence, which has become a big hit even among the secular crowd thanks to ele's appropriation. the appearance of the yankees caps alongside hats by sean john, kangol, and other urban fashion lines--but no other sports teams--suggests that the new-york insignia was seen more by the vendor (and, presumably, by perspective buyers) as a fashion statement, a symbol of all kinds of things (except, probably, the yankees): of up-northness, of urban cool, of upward mobility, etc. 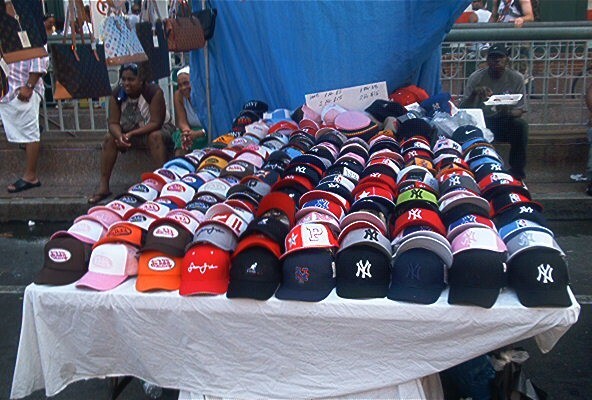 new york does boast the biggest caribbean population in the northeast US, if not the US outright, so it's not surprising that carib folk in boston and kingston alike would see a yankees cap as an appealing accessory--an identification with a pan-caribbean identity. 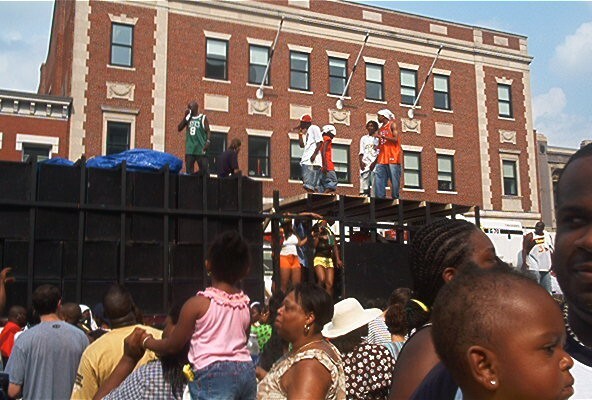 i'm looking forward to brooklyn's carnival this upcoming weekend, where, ironically, i bet yankee hats will be less popular. perspective is relative, seen? how you feel like?